U.S. Flood watches, evacuation orders as storm hits California Associated Press• February 2, 2019 A pedestrian makes their way across an overpass under a dramatic sunrise during the early morning commute in Los Angeles on Friday, Feb. 1, 2019. 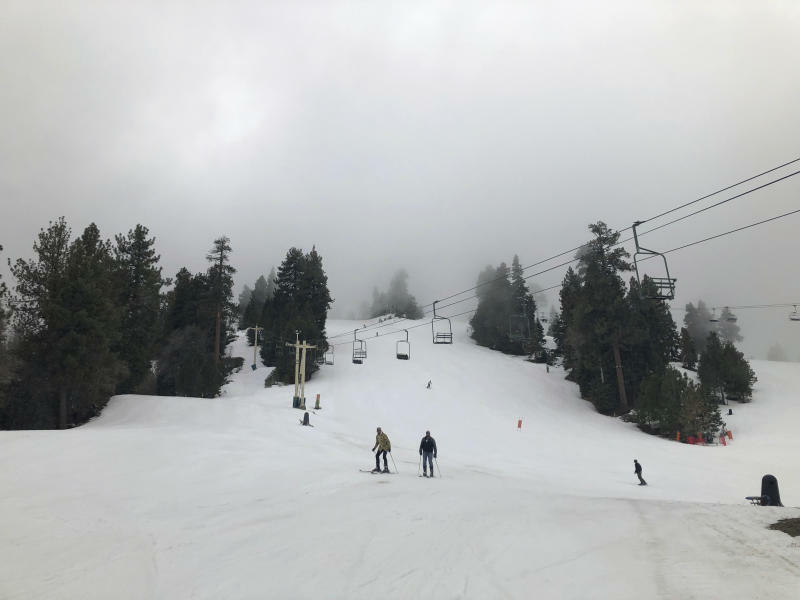 A powerful storm heading toward California is expected to produce heavy rainfall, damaging winds, localized stream flooding and heavy snow in the Sierra Nevada. Forecasters say rain will arrive in the north late Friday afternoon and reach the south late in the night, and last through Saturday night. (AP Photo/Richard Vogel)SAN FRANCISCO (AP) — A powerful storm descending on California Saturday threatened flooding in the entire San Francisco Bay Area and areas stripped bare by devastating wildfires.The storm that began moving in Friday night was expected to bring up to 4 inches of rain in some areas, winds gusting to 80 mph in the mountains, 10-foot waves and several feet of snow in the Sierra Nevada and other mountain ranges.The National Weather Service issued a flash-flood watch through Saturday morning for the entire San Francisco Bay Area and much of the Central Coast.”Heavy rainfall over a short amount of time will likely overwhelm storm drains and result in flooding of low-lying urban areas. Also, expect rapid rises on small streams and creeks” which could overflow, the weather service warned.Evacuations were ordered or recommended for many areas of Northern and Southern California that were hit by wildfires in recent months. Authorities fear that an inch of rain an hour could send fire debris, mud and boulders sluicing down denuded hillsides.In Malibu, where a fire last year destroyed many homes, Vidette Bell had her front door and garage barricaded with sandbags even before a previous storm hit.”I paid $3,000 to have these sandbags delivered,” Bell told KCAL-TV on Friday. „I didn’t want to have my house survive a fire and then get invaded with mud.”In the Holy Jim fire area southeast of Los Angeles, where an August wildfire scoured tens of thousands of acres in the Cleveland National Forest, volunteers using heavy equipment removed debris and deepened a creek bed to help prevent flooding.”In the last two days we’ve been able to move 19 dump trucks worth of debris from the creek bed and reinforce some of the walls here,” Keith Kothlow of Team Rubicon, a veteran-led disaster response organization, told KABC-TV.Santa Barbara County ordered evacuations of residents in designated debris-flow risk areas near the Thomas, Whittier and Sherpa fire scars. 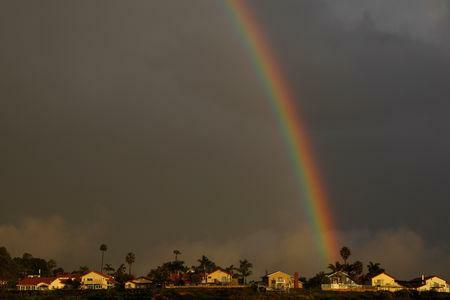 Nearby residents were urged to also consider leaving.It has only been a little over a year since a downpour on the huge Thomas Fire burn scar unleashed a massive debris flow that destroyed or damaged hundreds of homes in the seaside community of Montecito.The disaster killed 21 people, and two others have never been found.The weather service issued flash-flood watches for areas burned by the Mendocino Complex, Camp and Carr wildfires in Northern California.Winter storm warnings went into effect in the Sierra Nevada along with avalanche warnings on the Nevada side of the range. The Sierra is already loaded with snow from a series of storms in January. The weather service said areas could see accumulations of up to 10 feet over the next few days as a series of storms blew through.Numerous areas of the state were under warnings for high winds, some that could potentially knock down trees and power lines.Two cold weather systems will follow on Sunday and Monday, bringing additional widespread showers and snow, forecasters said. 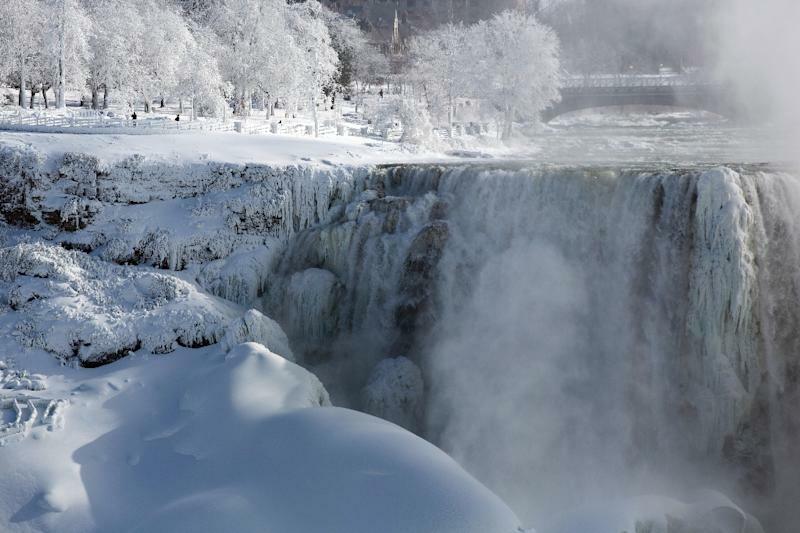 People walk in a park on the US side of the Niagara Falls on January 31, 2019 (AFP Photo/Lars Hagberg)Chicago (AFP) – A brutal cold spell that paralyzed the US Midwest, freezing water mains, causing power outages and canceling flights, eased on Friday, with forecasts predicting a rapid thaw.The two days of intense cold from the so-called polar vortex that descended on the US Midwest and Northeast will go down in memory for its scenes of winter at its most bitter.Blocks of ice floated down the river that runs through downtown Chicago, the rushing waters of the Niagara Falls were frozen in some places, and half the Great Lakes were covered in ice.US media reported as many as 21 weather-related deaths since a snow storm hit the Midwest early in the week, followed by plunging temperatures Wednesday and Thursday.Temperature readings were nosing up on Friday and „will continue to moderate,” the National Weather Service said.The concern, though, turned to the threat of flooding and further stress on already strained infrastructure as the region thawed out.”In some areas of the Midwest, the coming wild temperature swing will be the most extreme warm-up from record winter cold ever seen in such a short time period,” Jeff Masters, meteorologist at Weather Underground, told AFP.- Hundreds of new records -The Arctic air mass that veered off its normal polar route broke more than 340 records in communities across a cluster of states, according to the Midwestern Regional Climate Center.With wind chill factored in, temperatures dropped to as low as -64 degrees Fahrenheit (-53C) in Minnesota, -59F (-51C) in Wisconsin, -58F (-58C) in Iowa and -55F (-48C) in Illinois.By Monday, the weather was expected to be comparatively balmy — around 50F (10C) in Chicago and Detroit.”It’s important to remember that the rapid change in weather and snow melt could lead to dangerous flooding,” James Joseph, the regional director of the Federal Emergency Management Agency (FEMA), said in a statement.In the region around Niagara Falls, officials worried that ice jams could raise water levels in the Upper Niagara River, according to local TV station WIVB.Niagara Falls Mayor Paul Dyster said they were also working „to avert possible creek flooding once thaw comes.”In Illinois, state officials said they were discharging warm water from a nuclear power station into a river in order to prevent ice jams and flash flooding.In Detroit and Chicago, which have already contended with dozens of broken water mains over the last several days, more pipes could burst as rapid warming puts pressure on aging systems.- Return to normalcy -Elements of normal life resumed in fits and starts, including transportation.Thousands of flights were scrapped this week, especially at Chicago’s two major airports, which experienced more than 1,500 cancellations a day.The city is a regional hub, and passengers were left stranded or looking for alternate routes.”The majority of our customers have already been rebooked,” American Airlines spokesman Ross Feinstein told AFP on Friday.Delta Airlines spokesman Drake Castaneda said the company had „fully recovered from the polar vortex and have operated normally today.”Children — some of whom have been at home for almost a week — returned to class in many school districts, while others were off for another day because frozen school buses would not start.Milwaukee schools in Wisconsin were open, but Chicago schools were not.In Minneapolis, students were back in class but food deliveries for school lunches were disrupted.- Death toll rises -Hypothermia and frostbite proved to be major dangers this week.Officials repeatedly warned the homeless to take advantage of increased shelter capacity, and for others in need, such as the elderly, to use the hundreds of warming centers opened throughout the region.They also warned residents to not spend more than a few minutes at a time outside.Despite those efforts, there were still reports of fatalities.A 69-year-old FedEx worker was found dead outside of an Illinois delivery hub, according to TV station WQAD.The University of Iowa confirmed that Gerald Belz, a pre-med student, had died Wednesday. Local media reported that the 18-year-old was found unconscious outside a university building when temperatures were in the negative double digits in Iowa City.In Wisconsin, a 38-year-old woman was found frozen Wednesday night in an unheated home, and a man froze to death in his back yard Thursday afternoon, the Milwaukee Journal Sentinel reported. 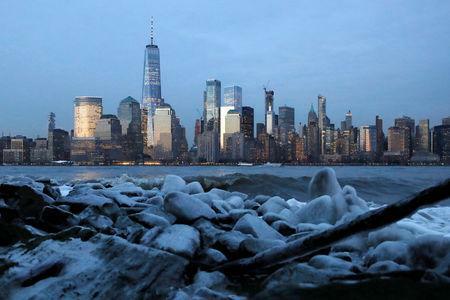 By Michael Hirtzer and Gina Cherelus,Reuters• February 2, 2019 Downtown Manhattan in New York City is seen over ice that formed on the banks of the Hudson River during below freezing temperaturesDowntown Manhattan in New York City is seen over ice that formed on the banks of the Hudson River during below freezing temperatures from Jersey City, New Jersey, U.S., February 1, 2019. REUTERS/Andrew KellyBy Michael Hirtzer and Gina CherelusCHICAGO/NEW YORK (Reuters) – Bone-chilling cold that paralyzed a chunk of the United States this week and killed at least 18 people eased on Friday as an errant Arctic air mass retreated ahead of a warmer-than-normal weekend in areas of the Midwest and Northeast.In Chicago, where the mercury dipped as low as minus 22 Fahrenheit (minus 30 Celsius) this week, temperatures of 22F (minus 5.5C) by Friday afternoon felt balmy for some in the nation’s third-largest city.”It’s got to be an almost 50 degree difference, it feels like spring,” said one commuter heading home from Chicago’s downtown financial district, wearing only a sweatshirt.Cable worker Brian Stachovic said he was up an electrical pole for only five minutes on Thursday before his fingers and toes went numb, and he had to go inside to avoid frostbite.”Today, working outside it was like normal,” said Stachovic, 40, wearing brown overalls and insulated gloves, as he worked in Chicago’s downtown.Temperatures from southern New England to the upper Midwest should reach the mid-40s to low 50s Fahrenheit through the weekend and Monday, forecasters said, after a record-breaking cold snap that stopped mail deliveries in some parts of the Midwest and shuttered schools and businesses.”The bitter cold air is going to be pushed up into Canada,” said Bob Smerbeck, senior meteorologist for Accuweather.The Midwest’s worst cold snap in two decades was created by the polar vortex, a reservoir of icy air that usually swirls over the North Pole. 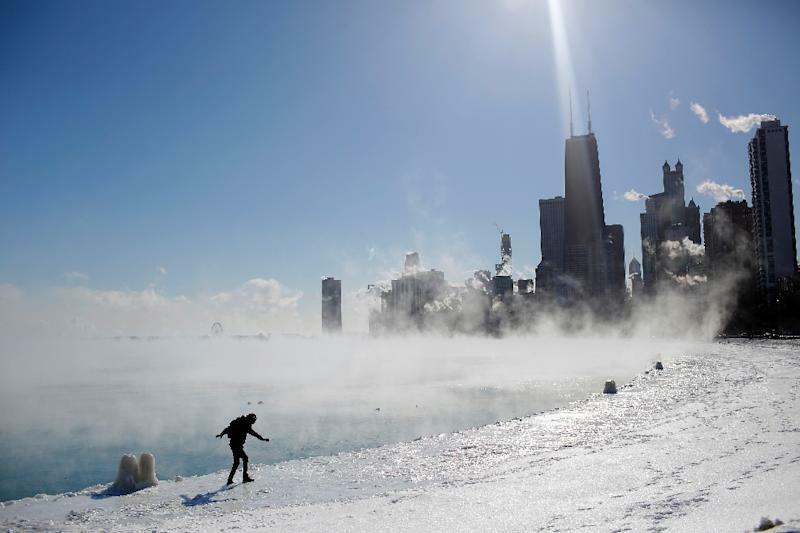 Shifting air currents caused it to slip down through Canada and into the U.S. Midwest this week.Temperatures on Friday afternoon ranged from the teens to the twenties, after cities like Chicago experienced sub-zero temperatures for two days and opened additional warming centers for the homeless.DEATH TOLL MAY RISE At least 18 deaths have been linked to the deep freeze since Saturday, and the number was expected to climb as authorities identified more victims.On Friday, police in East Moline, Illinois, about 160 miles (260 km) west of Chicago, said the weather may have contributed to the death of a FedEx freight driver whose body was found between two trucks on Thursday outside a company distribution hub.A representative for FedEx did not immediately respond to a request for comment.The Cook County’s medical examiner’s office said there were four confirmed cold-related deaths this week in the Chicago area.More than 40 cold-temperature records were broken on Thursday, the coldest morning since the polar vortex moved in late on Tuesday, clinging to a swath of the United States from Iowa and the Dakotas across the Great Lakes region and into Maine.Amtrak restored rail service to and from Chicago on Friday, and the U.S. Postal Services resumed mail delivery in six Midwest states.But while the U.S. Midwest and East Coast thawed out, a fierce winter storm headed towards California, carrying heavy rains and high winds that could touch off city flooding and mudslides.